Once again, you can blame it on the Beatles. The songs in 1964’s “A Hard Day’s Night” were like little movies that could be enjoyed as stand-alones. Then TV’s “The Monkees” swiped the format, punctuating episodes with songs acted out using improvisation, choreography and slapstick. Finally — here’s where end-of-days theorists perk up — Saturday morning kiddie shows got in on the racket. Series like, well, “The Beatles” (1965-67), “Frankenstein Jr. and the Impossibles” (1966-67), “The Archie Show” (1968-69), “The Banana Splits Adventure Hour” (1968-70), “Josie and the Pussycats” (1970-72), “Lancelot Link: Secret Chimp” (1970), “The Jackson 5ive” (1971-73) and “The Brady Kids” (1972-73) had characters performing pop. The “Scooby-Doo” kids (1969-70) drove the Mystery Machine, a psychedelic van. “H.R. 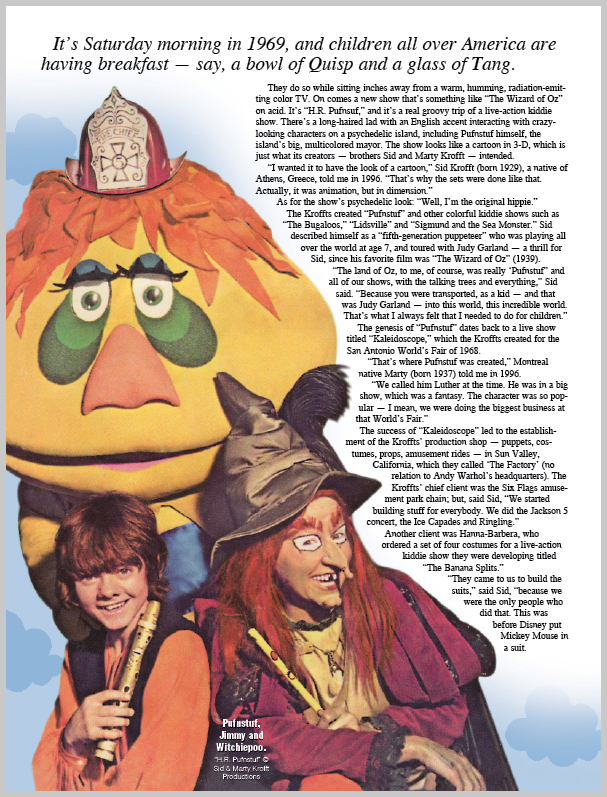 Pufnstuf” (1969-70) had Jack Wild, a long-haired Brit who looked like Davy Jones’ poor cousin. Oh, the agony that was in store for them. There was a thin premise, however. 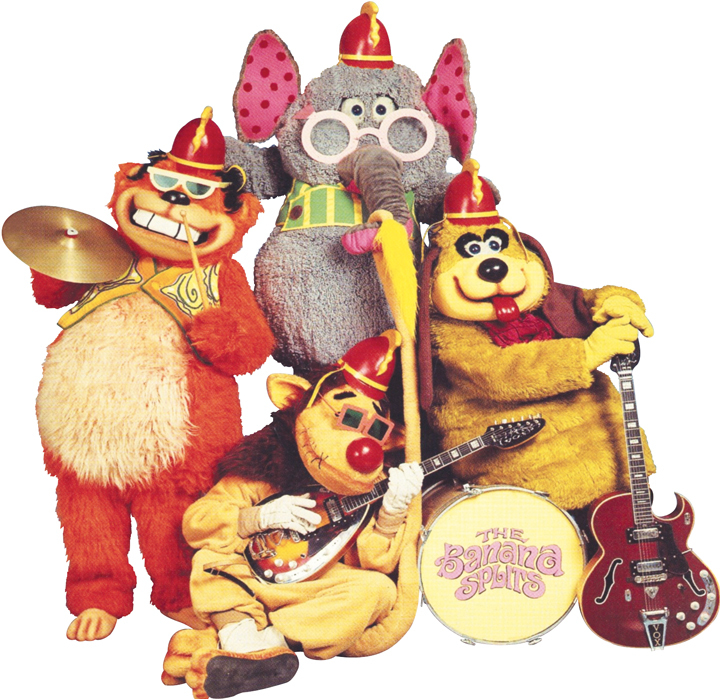 The Banana Splits was a pop band made up of animals which, species-wise, was quite integrated. Fleagle, the dog, tried to keep order (voice: Paul Winchell). Drooper, the lion, was a myopic hillbilly (voice: Allan Melvin). Snorky, the elephant, was the Harpo Marx of the band (no voice). Bingo, the gorilla, was the enigmatic one (voice: Daws Butler). No matter what calamity visited the Banana Splits, Bingo’s toothy, banal smile never wavered. It was kinda creepy. The weirdest, most watchable segments featured the Sour Grapes Bunch — talented little girls in lavender miniskirts and tights doing groovy dances. For some unexplained reason, the Splits cowered in the Sour Grapes’ presence. Yep, some accomplished folks worked on this dopey show. Director Richard Donner (“The Omen,” “Superman”) helmed several episodes — speaking of people you’d assume wouldn’t be caught dead with “The Banana Splits” on their resumé. It’s Saturday morning in 1969, and children all over America are having breakfast — say, a bowl of Quisp and a glass of Tang. They do so while sitting inches away from a warm, humming, radiation-emitting color TV. On comes a new show that’s something like “The Wizard of Oz” on acid. It’s “H.R. 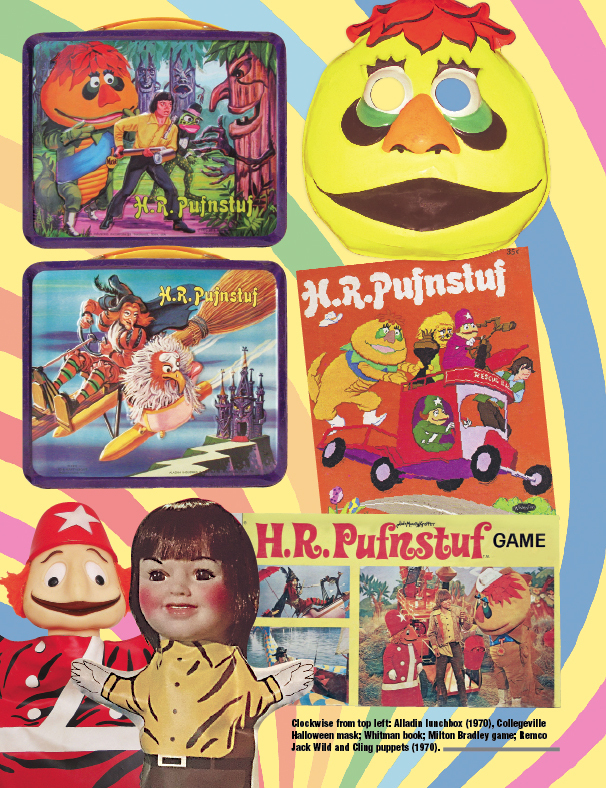 Pufnsuf,” and it’s a real groovy trip of a live-action kiddie show. There’s a long-haired lad with an English accent interacting with crazy-looking characters on a psychedelic island, including Pufnstuf himself, the island’s big, multicolored mayor. The show looks like a cartoon in 3-D, which is just what its creators — brothers Sid and Marty Krofft — intended. The Kroffts created “Pufnstuf” and other colorful kiddie shows such as “The Bugaloos,” “Lidsville” and “Sigmund and the Sea Monster.” Sid described himself as a “fifth-generation puppeteer” who was playing all over the world at age 7, and toured with Judy Garland — a thrill for Sid, since his favorite film was “The Wizard of Oz” (1939). The Kroffts developed a premise about an innocent lad lured to Living Island by the evil Witchiepoo, who covets his magic flute. (Yeah, it sounds pervy.) Soon, the search was on for a young actor to play Jimmy. Coincidentally, Sid was in England watching a rough cut of “Oliver!” (1968), which had an unknown actor named Jack Wild in its cast. Sid had found his Jimmy. “I, unfortunately, kind of adopted him,” Marty said. Wild soon became a teen idol, landing on the cover of 16 Magazine — and in the hearts of teen and pre-teen girls. “He was the hottest kid in America at the time,” Marty said. For the Kroffts, TV production presented a steep learning curve. Marty was most proud of the opportunities he and his brother gave to aspiring young talent over the years.